Copenhagen is a world leading city when it comes to encouraging cycling as an everyday transportation mode. Copenhageners want to cycle & the city of Copenhagen wants it’s citizens to cycle more. How are cargo bikes used in Copenhagen? There are over 40,000 cargo bikes in Copenhagen! How can cargo bikes help Ireland? 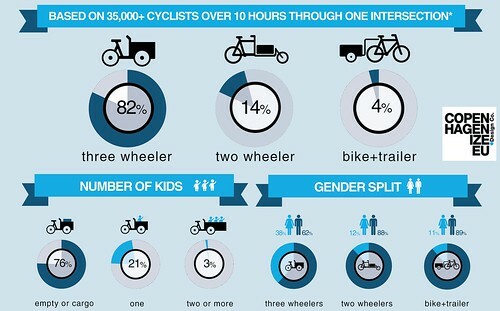 Lower overall congestion: As with any form of cycling, by having more families use a cargo bike as transport mode over choosing a car, then it means less traffic on our roads. Reduced road maintenance: A cargo bike is the fraction of the size & weight of a typical family car. By taking more cars off the road, it reduces the wear & tear on our road infrastructure which in turn reduces the amount of money required to maintain our infrastructure. Zero emissions: A cargo bike does not pollute our environment. It would help Ireland cut its increasing transport related emissions which we are legally bound to cut as part of an EU agreement but are failing to do. Healthier lifestyle: Cycling is proven by many national & international reports to help improve an individual’s health which in turn has a massive impact on our public health budgets. A cyclist pushing around heavier cargo, is doing even more exercise! The catch 22 is as always in Ireland is trying to put in place long term thinking & investment in our infrastructure. Our existing road infrastructure is not well maintained for road users including cyclists. Many of our local authority or national government policy makers need to give proper consideration to cycling as a short & long term solution to Ireland’s growing traffic congestion & cargo bikes have a significant part to play. Some safe space would be a good start. Next Giggles & chatter from the passengers in the front!